NoHo Just Got More Theatre! The NoHo Arts District is a one-square-mile community home to 20 theatres. But what makes this characteristic unique, are the theatres companies that use these theatres to create their art. We’ve always said, NoHo is only as great as its people. So when a new theatre company chooses the NoHo Arts District as their new home, we must introduce them to the district. Welcome to the neighborhood, Kelrik Productions! They’ve made the Monroe Forum Theatre at El Portal their new home. Look out for some more great shows from our new residents. We spoke with Erik Kelrik to get more information on the new NoHo residents. What is Kelrik Productions ? MISSION STATEMENT: Kelrik's mission is to provide the highest quality, innovative theatre, featuring local talent and first-rate production values. As a company, Kelrik is dedicated to the growth of our actors, theater-goers, and the artistic medium in which they all connect. Kelrik Productions originated in Portage, Indiana, as a small neighborhood theater group founded by brother and sister team Erik and Kelley. They continued their love of theater and productions after moving to San Luis Obispo in 1988. Together, they have produced various plays and musicals, beginning with classic fairy tales. After many years of performing and producing, Kelley’s life changed direction; her new stage is set at a San Diego Courtroom where she "performs" as a Public Defender supporting people in another way. Erik has persevered in his endeavor to provide audience-pleasing productions which provide food for thought -- as well as being great fun! Kelrik Productions has given San Luis Obispo high caliber community theatre on the Central Coast since 2004, and became a non-profit company in 2008. Kelrik is dedicated to providing quality live theater to the Central Coast and surrounding communities. Each year, the company presents new works, as well as previously produced plays, that uphold the high standards and artistic vision of Kelrik Productions. Our goal is to challenge, motivate, enlighten, and captivate our audiences; to introduce young people to, and foster their appreciation of, live theater; to evoke thought and change, both personally and within society; and of course, to entertain. To help accomplish all these goals, Kelrik Productions has a adopted a philosophy of “Edutainment”, teaching audiences about theater and society, all while entertaining them at the same time. As a theater company, we aim to promote the growth of actors and audience members through our dedication to the art of theater, the medium in which performers and audiences connect. We are also excited to announce our expansion back into the Los Angeles theater community. As part of our CELEBRATE 2015 season we will also perform at the Monroe Forum Theatre located in the historic El Portal Theatre. Centrally located in the heart of North Hollywood and originally built as a vaudeville house in 1926, the art deco theatre was meticulously rebuilt in the late 90s. We hope to entertain both our younger and more mature audience members to create a truly magical theatre experience. Why did you start Kelrik Productions? I have always loved theater and knew this would always be my full-time job! I have a bit of skills in many aspects of theater from directing, costume design, acting, lighting and set building and painting sets and props. Why did you choose NoHo Arts District? I moved to NOHO after graduating AMDA. I announced the return into the Los Angeles theater community with our DISCOVER 2014 Season where we staged three shows after leaving the Excalbur Theater in Studio City nearly nine years and relocating the company to San Luis Obispo. Jay Irwin and Peggy Forrest welcomed me back to NOHO with open arms to the Monroe Forum Theatre located in the historic El Portal Theatre. There is no better way for me to begin to share with you my ideas and dreams for Kelrik than expanding the company as Artistic Director. Kelrik is a magical place, with 20 years of glorious history of producing more than 120 musicals. This CELEBRATE 2015 season, and the seasons ahead will look to the future of theatre in exciting and challenging ways, as well as always keeping an eye on Kelrik’s heritage. Roald Dahl’s timeless story of the world-famous candy man and his quest to find an heir comes to life in this stage adaptation which features songs from the classic family film. 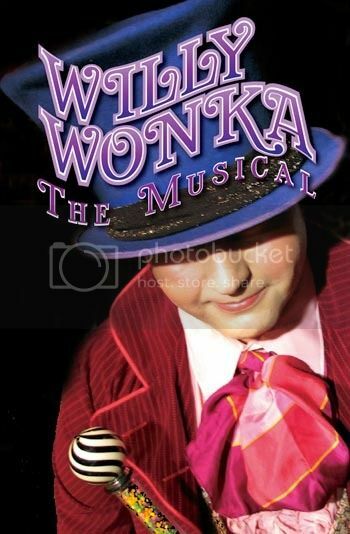 Willy Wonka is a scrumdidilyumptious musical theatre treat guaranteed to delight everyone’s sweet tooth while taking you on a fantasy ride into the land of pure imagination! After critically acclaimed sold out performances in both Los Angeles and Palm Springs, award winning stage star Kristin Towers-Rowles brings her award nominated musical cabaret show to the El Portal for one night only. A Lovely Lineage captures the historic Hollywood and Broadway lineage of Kristin Towers-Rowles starting with her grandmother, the legendary Kathryn Grayson. Ms. Grayson was an MGM darling and Hollywood pioneer having starred in some of the most beloved movie musicals of the 1950s including Kiss Me Kate and Showboat. The lineage does not stop there. Her grandfather was the talented and dashing Broadway leading man Johnnie Johnston. Her mother, Patricia Towers, was a headliner in Vegas, and her father is the recognizable character actor, Robert Towers. Kristin celebrates her family’s legacy by performing music from such notable Broadway standards as Kiss Me Kate, Follies, Wicked and She Loves Me to name a few. The trials and tribulations of a man who always wanted to be a star. With sardonic wit and incisive critiques, Erik Austin tells all his tales from childhood to his failed marriage. It all adds up to the most distinctively skewed up musical autobiographies ever written.